Optimality theory (OT) is a comparatively recent linguistic theory which has been introduced in the early 1990s. OT's description of children's error patterns as patterns that are derived from a hierarchy of conflicting universal constraints has much higher explanatory power than the underlying phonological representations posited by generative phonology which focused only on production. 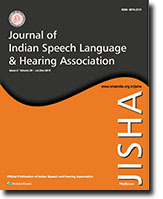 This tutorial article aims to introduce speech clinicians some information about the basic architecture and formalities of OT and highlights some of its advantages over rule-based generative approaches in different linguistic contexts. The article begins with a brief definition of (functional) phonological disorder and explains the basic components of OT and its proposed model of language development in relation to first language acquisition. Finally, the role of OT and standard generative phonology in the assessment of phonological errors produced by children with atypical phonological development is illustrated using empirical data based on Persian language. Context: Sentences are rich in redundancy, and therefore, their identification is often facilitated by the context. The use of phrases introduces limited contextual cues into the process of identification and facilitates the evocation of words. Thus, there is a need to develop phrase recognition test to assess identification abilities. Aims: To develop and validate phrase recognition test in Kannada language for assessing speech recognition in noise. Settings and Design: Normative research design was utilized. Subjects and Methods: A total of 70 phrases in Kannada language were constructed and 67 of them were selected based on familiarity rating. Ten participants each in two groups were involved for the list equivalency and validation. Statistical Analysis Used: Repeated measure of analysis of variance was utilized for the lists equivalency and standardization. Results: Sixty-seven phrases were shortlisted from 70 phrases through familiarity rating. These phrases were embedded in different 5 signal to noise ratios (SNRs) (−9 dB SNR to −1 dB SNR in steps of 2 dB). Analysis of results showed 50% recognition score at ~−5 dB SNR. In addition, the phrases that were too easy and too difficult were eliminated. From the remaining phrases, five lists of 10 phrases each were constructed and compared for their equal intelligibility in noise. The results revealed no significant differences across the phrase lists. Conclusions: The homogenous five lists of the Kannada phrase recognition test will be useful to assess identification ability of the listeners and hearing aid benefit. Objective: The present study intended to compare the accuracy of speaker identification using aural perception and semiautomatic method (Mel –Frequency Cepstral Coefficient; MFCC), when the speech is in disguise condition by using the handkerchief during recording and to check the percentage of correct identification in the semiautomatic method when the vowel and consonant segments were used for analysis. Methods: Thirty speaker's single sentence speech sample was recorded in undisguised and disguised conditions were randomly paired into the sets of one undisguised followed by five disguised samples for the task of speaker identification. In aural perceptual method the five judges listened to the samples and made a decision on the match. In MFCC method, from /ðə/ segment, ten coefficient values were extracted. The coefficient values were manually averaged and the pair that obtained the lowest value of Euclidean distance was determined to be the sample of the same speaker. The Kappa agreement was used to find the agreement between the two methods in speaker identification and the percentage of correct identification was calculated for the vowel and consonant segment analysis. Results: The results revealed the kappa value to be negative (k < 0) indicating no agreement between the two methods. The percentage of correct identification using aural perception ranged from 56.7% - 80% and for MFCC under whole word, consonant segment and vowel segment analysis were 46.7%, 26.7% and 53.33% respectively. Conclusion: The aural perception method had a greater percentage of correct identification than MFCC though it was not statistically significant for speaker identification from disguised speech.